Printing format and template can be changed from time-to-time by authorized users via its State-of-the-arts web-based administration program. Printed on the Queue Tickets via Queue Ticket Printer/s. Displayed on and/or send by the Multi-Channel Queue Booking Interfaces (Item#1 above). Adv. format and template can be changed from time-to-time by authorized users via its State-of-the-arts web-base administration program. b.1) Call for the next queue. b.2) See the queue traffics. 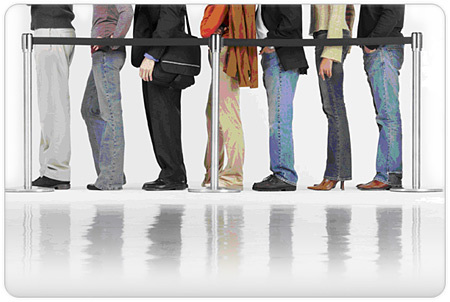 b.3) See queues of different categories (if any). It notifies the customer (via the following channels) when his turn is approaching. Traffics, Response Time, Attendance Durations and Statistics Reports and Graphs based on Hourly, Daily, Weekly, Monthly and Yearly. Statistics Comparison reports base on Time-Range of the day, day of the week, day of the month and month of the year. Users/Agents Statistics and Activities Reports. State-of-the-arts web base Report generator program. It provides state-of-the-arts robust, powerful and open-standard CTI engine for seamless integration with multimedia communications systems, contact centre solution and any other IT solutions (CRM, ERP, etc) via Web-Service, Message- Queue (MQ), Standard XML, Voice-XML and TCP/IP socket communication. It’s seamlessly integrated with PowerX multimedia Communications Server, PowerX Contact Centre Solution as well as PowerX.Net CRM (Galaxy). It can easily configure to provide advanced solutions such as Screen Popup of customer profiles and transaction histories. It has been designed with a powerful Service Oriented Architecture DNA to deliver the utmost service quality and monitoring for your operation. It’s seamlessly integrated with PowerX-SOA and PowerX-Beans to provide multilevel multimedia escalation and intelligent KPI (Key Performance Indicators monitoring and management solutions.